Councillors will decide tomorrow whether to name a town square after a comedy duo after a weekly newspaper’s campaign. 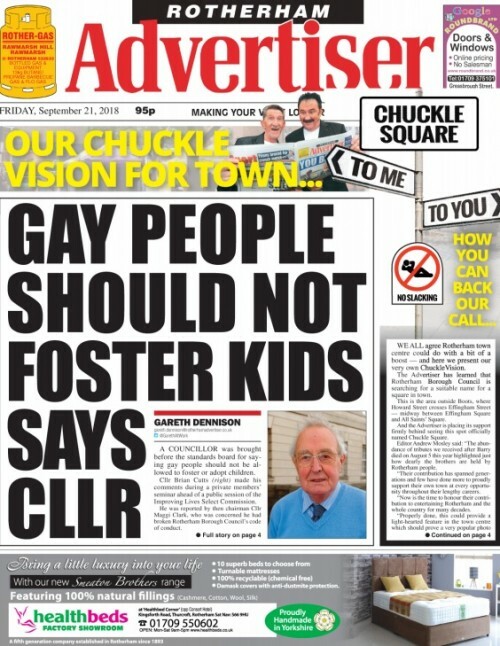 HTFP reported last month how hundreds had backed the Rotherham Advertiser’s campaign urging Rotherham Borough Council to dub space in the centre of the Yorkshire town as ‘Chuckle Square’ in honour of Barry and Paul Elliott, better known as the Chuckle Brothers. The Advertiser handed in a petition of 681 signatures, though more than 1,600 backed the call – but the council said it did not recognise signatures gathered on the change.org website. Last week editor Andrew Mosley appeared on two BBC Radio Sheffield shows and ITV’s Calendar news programme to talk about the campaign, which has been backed by comic Bernie Clifton and Rotherham United Football Club legend John Breckin. Barry Elliott died last year aged 73, but surviving brother Paul has backed the Advertiser’s campaign. Said Andrew: “We did originally ask the council if they wanted to stage a vote in the paper, but they weren’t keen. We had done this previously to invite readers to choose the colour of a new recycling bin and more than 5,000 voted. “We decided to go ahead with our own campaign instead and handed in the petition. We asked if we could use our 15 minutes of allotted time in the council chamber next Wednesday to show an episode of ChuckleVision, but we were told this was against the rules. “The support from people has been really encouraging and the local radio and TV got behind the campaign, which was nice. It’s appeared in a couple of nationals too. “A few people have criticised it as being a bit silly, but many towns and cities have streets and areas that are named far more inappropriately. Penny Lane in Liverpool, for example, is named after James Penny, who was involved in the slave trade, but it’s a tourist attraction so unlikely to be changed. why not? better than naming it after some boring councillor. Why not even ‘Chuckle Brothers Square’. They brought joy to so many. To me, to you.